Tufted Duck, originally uploaded by dmzajac2004-. Photo Copyright © 2013 Deborah M Zajac. All Rights Reserved. 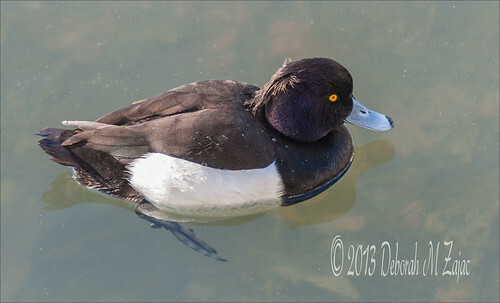 My friend Phil sent the link to the article about this Tufted Duck that migrates to Oakland rather than where he’s supposed to go which is Asia. Phil and I both had Thurs. afternoon free so we met at Merritt Lake to find him. The folks in the resource center were really great, they gave Phil a direction to go look. Lake Merritt is pretty big! He is hanging around with a flock of Scaup. He blends in really well. Thank you Phil for sharing the article and letting me go with you to find him! Previous Previous post: Wood You Be Mine?